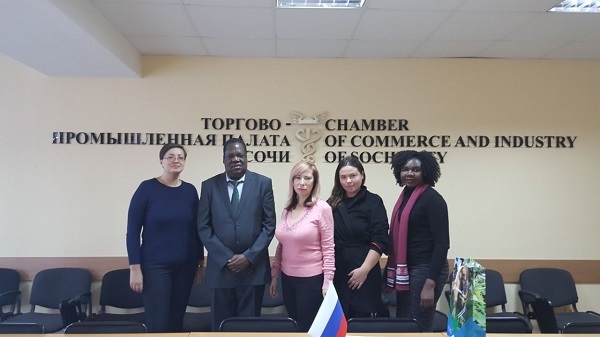 Ambassador Johnson Agara OLWA met Ms Natalya V. AKHTYRSKAYA this afternoon at the Chamber of Commerce office in Sochi, Russia this afternoon. They discussed possibilities of collaboration . Tourism being the main economic activity of the City of Sochi , Uganda can benefit from exposing the personnel in the tourism sector through training and placements in Sochi tourism and hospitality sector considering that Sochi is a resort city. Amb. OLWA invited the business community in Sochi who are mainly in hotels and restaurants to consider setting up hotels in Uganda but also encouraged them to consider the various investment opportunities in Uganda as well. A second meeting has been scheduled in February 2018 during the International Investment Forum that will be hosted in Sochi. Ms AKHTYRSKAYA extended an invitation to the Ugandan entrepreneurs to participate in the forum .